1. Photo(s) used in the final image must be taken at the same focal length and using the same equipment. 2. And within the same 24 hour period. 3. With no introduction of or removal of elements except those that are “small distractions”. •	Cropping – any amount. •	Color correction, saturation or desaturation (but not color change. Green eyes should not become blue ones – though “red eye” correction is certainly ok). •	Selective coloration, including black and white, duo toning, etc. •	Perspective or lens aberration corrections. •	HDR, or bracketed exposure combinations together with tonal compensation. •	Use of any elements taken a different focal lengths or with different equipment unless those elements are resized proportionately and placed in their correct and actual location. •	Moving elements in a single image to other locations (except incidentally to clone out or cover over issues). My personal limits are nearly identical to yours, Steven. Most of what I believe is “allowed” has to do with compensating for the limitations of the camera system, such as dynamic range and depth of focus. Once I pick a location and focal length and lock it down on a tripod, I believe that changing focus point, ISO, aperture, shutter speed, etc is “allowed” and that the subsequent blending is an endeavor to communicate the way the scene appeared to our eyes and brain. 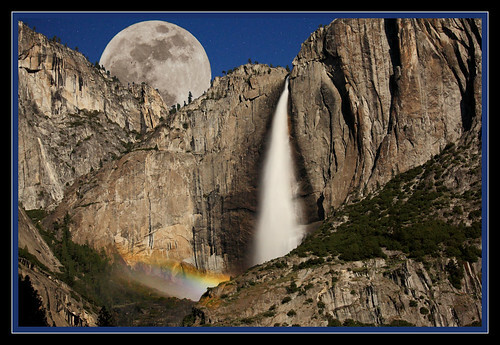 I also accept merging lighting sources such as using the moon to illuminate a foreground and then waiting for the moon to set to take a darker image of the stars. Light painting is also acceptable in my world. In each case, the adaptations of our vision system make it possible to see a higher dynamic range than the camera can and I am trying to compensate for that. Changing focal length or moving the camera to pull another object into the scene or make it appear larger or smaller in comparison is stretching the truth, in my opinion. It’s all subjective, though. Most of us are trying to create “art” rather than be photojournalists, so you will get a lot of different opinions on what is acceptable. In the “competition for eyeballs”, the images that cross our lines often get a lot of recognition. It makes it tougher to stand out with an image where we are trying to be more “honest”. I agree whole heartedly. Thanks for your comments, Rick. On a philosophical level I’ve always said that once you take a 3-D real life environment, unfolding over time, and reduce it to a 2-D artifact of a tiny slice of that view, over an unmoving fragment of frozen time, then everything else is just splitting hairs. I knew a white water canoeist who decried my soft time-exposures of falls and rapids, because it was “cheating” and “messing with nature”. He preferred shots where the action was frozen so you could see each bubble in the maelstrom. In my opinion, this was due to his bias of being a white-water canoeist and kayaker. Perhaps his increased metabolism during rapid runs required him to see, or maybe caused him to see, the world in that kind of split-second clarity, in order to survive the run. But is a real event frozen and stolen in a thousandth of a second any more or less “cheating” than a moment frozen over a fifth of a second, or even 5 hours? “Intention” is where it starts to diverge for me. If there’s an intention to deceive, like your example of the relocated beach, then it becomes more clear-cut. Yes, it IS cheating. But cheating in the marketing sense, not cheating in the photography sense. I think nothing of dropping in a moon here and there, sometimes made larger for drama. Composites of many kinds are found throughout my stream. But I tend to be upfront about it, and would certainly offer that as disclosure if it was a piece I was selling. Thank you, R.G. for your observations. Surprisingly, I agree with you much more than you might suspect. However reality has left the building when someone posts an image like this in, e.g. 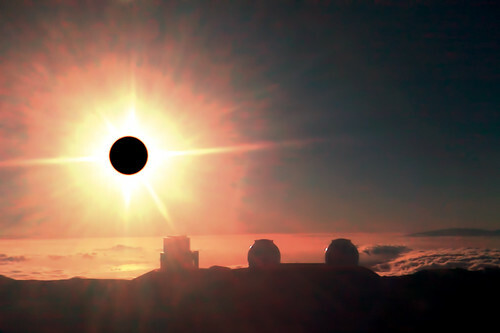 the 2012 Annular Solar Eclipse group and deletes comments by people asking reasonable questions, like “is that real”. A first grader once asked me what the difference is between telling a story and telling a lie. The question goes straight to the motive, just as our justice system distinguishes “Murder” from “Homicide”. If I post photos like the “My What a Big Moon” to attract people’s attention for the “Catching the Moon Webinars” it doesn’t speak well for my ethics, IMHO. I am, by the way, an amateur magician. Magicians “tell stories” in part because telling the truth destroys the moment and the wonder. Awesome, and a good analogy. Photography is a kind of magic right from the get-go, even straight-out-of-camera shots. When you seek to embellish the results with other techniques, you’re just “telling a story” with your sleight-of-hand, and it’s all good. But when you’re picking pockets, not so much. My personal limits are little more flexible than yours. I don’t draw on my photos but I do sometimes ‘improve’ them by borrowing real world artifacts from other photos. Most noticeably, clouds. I have many pictures that have become much more pleasing because of a correctly placed fluffy rain maker. And then of course, there’s my true composites. I don’t think of these as photos and so feel free to play with them in any way I need. Take my recent picture of an 8 armed Deanna sitting in a shaft of light (http://photoshopscaresme.com/antelope-gods-playing-in-antelope-canyon). She doesn’t really have 8 arms and there was no light. My point is, I’ll use all the tools at my disposal to make my images more compelling, but I’ll also tell you what I did – being a liar and a photoshop user is a bad combination. On the “borrowed clouds” thing… if you’re putting tornadoes in Temecula, or Lenticulars over the ocean I’m going to yell foul – they’re more rare than sunshine in Seattle. And when Deanna’s arm is coming out of the summit of Mt. Ranier you’ve definitely crossed over my line. Very good commentary and I agree with your “acceptable” list, particularly as it pertains to images of the natural world. I also agree with R. G. Daniels comment about intent. I also believe there is nothing wrong if someone is intending to create “art” by combining elements from one image into another. However, there should be a note with the image that it is composited to depict the artist’s/photographer’s vision. This goes for star circles as well if the image is created from a composite of multiple images. Where “intent” comes into play and the challenge for a lot of photographers is to try and capture our vision of a single scene in one or two shots to show the existing details of that scene. This takes a lot of planning and technical skill. and is hopefully rewarded by the viewers’ appreciation for the scene and if the viewer is knowledgable — appreciates the photographic skill that went into capturing the image as well. On the other hand, if a photograph is create by inserting many elements using PS like software, then it should be noted, and the viewer can not only appreciate, or not, the image but also the software skills of the photographer. To try and pass off an image based on software skills as opposed photographer/photography skills is disingenuous and that is where I have ethical issues. Thank-you for posing this question of “what [we] think the boundary between fantasy creation and photography should be”. I yield to the well-written comments of Marsha’s, above. I believe boundaries should be defined and clear ….and I’ve recently been wondering when/if we, who think we can spot a “fantasy creation”, should shout-out when we think there is something “cheesy” going on? I’ve discovered that calling people out on fantasy in general does little more than alienate people. One fellow posts lots of images on Facebook with highly embellished moons. When I asked him how he had managed to get a large moon in the northern sky he deleted my comment. So I only managed to antagonize a fellow photographer – and his fans. A Flickr user deleted my comment and banned me for challenging his fabricated Annular Eclipse – but in that case he posted it in a group specifically dedicated to the Annular Solar eclipse with tags that indicated it WAS the eclipse. The scientist in me bristles at that and I’ll continue to call people down on those deceits. I see, thank-you for the post and response Steven. I wondered what others could do/have done should a fake be spotted in a photo contest, etc.. It gets a little heavier, taking the next step (after defining boundaries) and deciding to ‘own it’, risking “antagonizing” fellow photographers and their fans. I totally agree with you on this. I find that many people don’t take criticism well and will instantly ban you should you call out a fake. I too came across a photo too good to be true: A Golden Gate Bridge photo with low fog, blazing sunrise colors, and a larger than normal setting crescent moon with venus next to it all in one shot. Though many people commented on how amazing this shot was, I instantly knew it was a fake as the crescent moon with venus only ever appears in the sky in the winter towards the west at sunset. 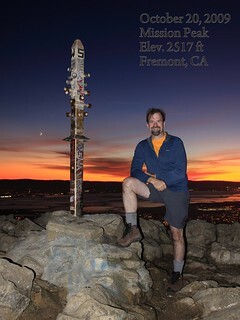 Luckily, I didn’t alienate the photographer and he admitted to me that it was a complete composite. He even went further and admitted that the original photograph of the Golden Gate Bridge was bland and had almost no colors. All the beautiful sunrise colors were photoshopped in. I’m fine with people creating artwork if that was their intent, but I have major gripes with people trying to pass off blatant composites as true one-shot photographs. This is an excellent article. Reading through it, I feel like this topic should be talked about as one of the first things (for those interested in photography) you need to be educated about and use it to form your set of photography principles. I am fairly new to photography but I have seen people coming in after me (maybe I wasn’t paying as much attention before) spend less time shooting a picture and more time post-processing it. I started with the principle of not touching a picture in anyway after it comes out of the camera (this was before I understood the limitations of camera’s) to forming a set of principles very similar to what you have put down here. That being said, I do run into situations where I feel that I need to revise them. My most recent situation, shooting of the Annular Solar eclipse. I shot multiple close shots of the eclipse but didn’t plan (and didn’t have a second camera) for a wide angle stacked picture of the eclipse moving by a foreground. I wanted to create a single picture that shows the interesting phases of the eclipse using the close-up shots. I just took a black background and placed the phases of the eclipses diagonally to achieve this. If properly declared as not the actual flow of events, what do you guys think of this? Ajay: I think my answer depends on what your purpose was and what you claimed to represent. 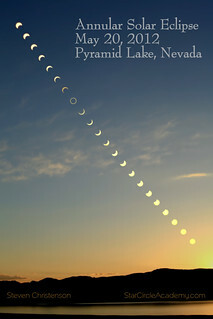 Most people chose key parts of the Annular Eclipse to highlight in tabular, linear or circular form. The result is an illustration of the events over time and some of them were very cleverly done. On the other hand, some people took pictures of oranges or other objects, photoshopped them and claimed they were the eclipse itself by posting them to groups specific to the eclipse. That’s deceptive. I like this photo and am wondering if this is real or fake. I have a really good idea but would like to hear from someone else. Fake in that it’s clearly not a single exposure – though that doesn’t disqualify it, IMHO. The lit side of the moon indicates it is in a waxing phase and nearly full. The scale is quite possible – about the right size if taken from Yerba Buena Island. The thing that troubles me is that I believe the lit portion should be on the lower right – that is, facing more toward the horizon. This configuration seems to match a photo taken toward the east. I’ll have to do some more thinking about it. 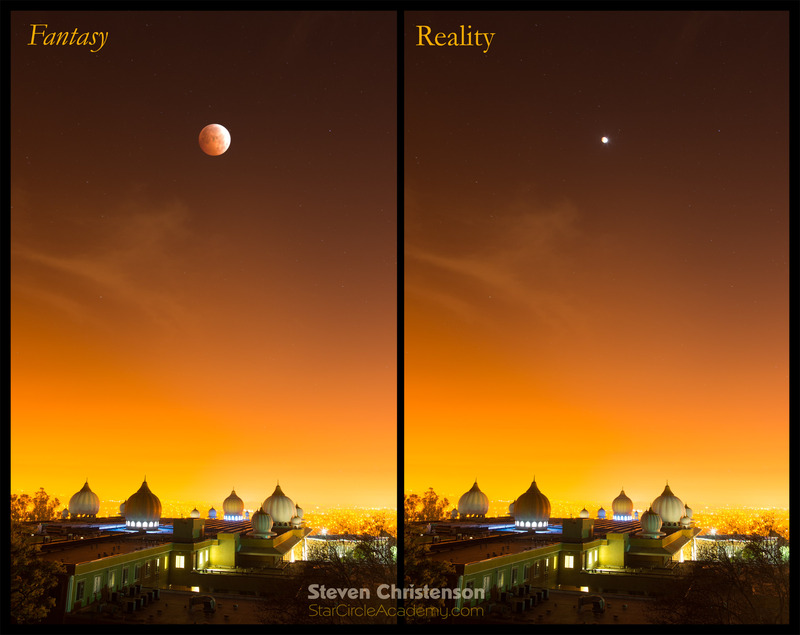 Indeed, it would be fun to take photos of the moon from rise to set and compare. Should be about the same phase TODAY as in the photo. I agree. The reason I thought it was fake is because I used TPE and on the date the pictture was taken, it doesn’t line up. My main question is if that location on Yerba Buena would really result in that picture because I dont think it would work. Also, the moon is almost full and TPE says it should be 51%. However, I could be all wrong about this and that is why I asked. I didn’t see any EXIF data with date information – only the upload date. I know from experience, also that often the “date” ends up being the date of image processing. As for Yerba Buena, yes, I’m sure at the right time of year it could work and be about the size shown in the panoramio photo. I just noticed one more thing. The exposure time says 13 sec. That would cause the moon to be over exposed. You are right, it is multiple exposures. I grabbed the photo and used photoshop’s measuring tool. 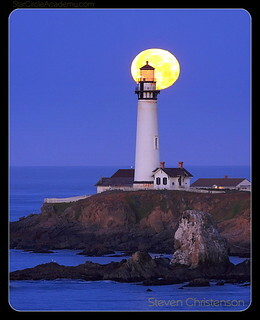 The ratio of the moon diameter to the rocket height is 1 to 13.3. This means the angular height of the rocket is 13.3 x 0.5 degrees. It also appears that the base of the rocket is just slightly above eye level, so the altitude of the moon is about 1/2 of a moon diameter less or about 6 degrees above the horizon. The first question is was the photographer at a reasonable distance relative to the subject. 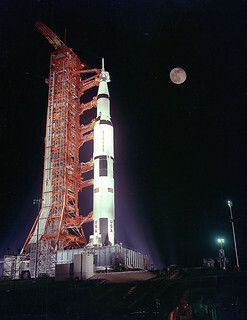 A quick Google search says the height of a Saturn V rocket is 363 feet. Since the moon is 1/13.3 the size of the rocket, we can calculate the distance from the rocket as follows: 114.6 * 363 / 13.3 = 3106 feet. That seems reasonable and possible so the scale of the moon relative to the rocket is OK.
As for atmospheric distortion… 6 degrees is pretty high. From my experience anything above 4 degrees can be quite clear. Finally there is the question of clouds. Fortunately just a few days ago I shot a moonrise where there were lots of clouds. By the time the moon reached about 5 degrees high in the sky and was not obscured by clouds it was dark enough that my exposure of the moon ONLY showed the moon. Therefore it seems reasonable that a floodlit rocket in a dark night might indeed match the moon brightness and create the possibility of capturing everything in a single exposure… EXCEPT for one artifact I noticed. Notice the peculiar ring of brightness that extends over 3/4 around centered at the bottom left edge of the moon. The caption indicates this is an Apollo 17 mission. The launch of that mission in 1972 predated all digital technology capable of making such a large image, so my assumption is this was an analog photograph. I suspect that the halo effect was created by placing a properly exposed moon over an over exposed moon – something that would have been comparatively easy to do in the days of film negatives by literally stacking them. One more thing that also seems to make it all close to reasonable is the absence of stars. At night a properly exposed moon will net almost no stars at all due to the extreme difference in brightness between the moon and the stars. On close inspection the bits of bright dots MAY be stars, but may also be flare and noise. So my conclusion is this may be a legitimate HDR analog photo composite and not a fake.